party in a genuine opposition to the Tory majority in Parliament. Enoch Powell only looked like an extremist because by the time of the ‘Rivers of Blood’ speech the country as a whole was becoming less racist; the Overton Window had shifted. In 1920 that speech wouldn’t even have made the national papers, let alone the front pages. The post-war social democratic consensus  against which Powell was fulminating was the result of a radical movement of the Overton Window to the left, caused by the Great Depression and the ‘in this together’ ethic of WWII. None of this is controversial. 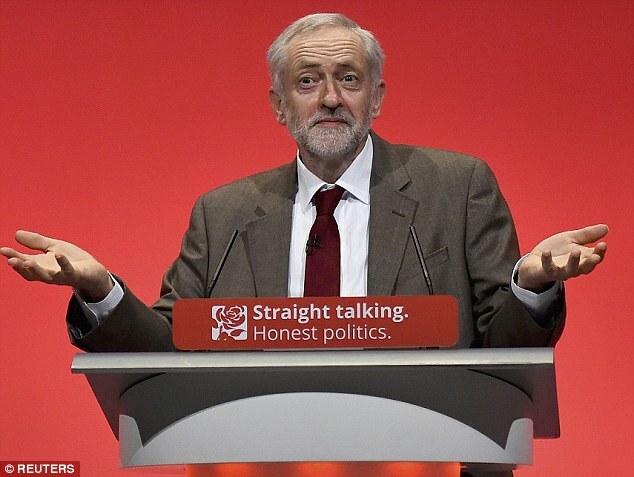 The idea that Jeremy Corbyn is a ‘loony lefty’ most certainly is controversial. In fact, it is entirely the product of a deliberate (and very skilful) shifting of the terms of debate so far to the right that David Miliband found himself fighting an election on a platform that was in places to the right of Margaret Thatcher’s. Politics in the UK has changed so much in my lifetime that UKIP got taken seriously this election: look how much press time they got for free, and from Aunty as well as the tabloid channels. That would simply not have happened 20 years ago, because everyone would have seen them quite accurately as ridiculous xenophobes. And imagine the field day Spitting Image would have had with them… However much I might dislike Thatcher’s policy decisions, her Tory party were practical and serious politicians. She would never have stood for an extreme right wing party making her look bad; else the BNP would have achieved in the 80s what UKIP achieved this year. For a long time, both New Labour and the Tories have been arguing that their radical move to the right was being driven by an electorate who were increasingly right wing. If the Corbyn victory tells us anything, it is that this is not true. Inevitably, there has been a lot of rancor flying around ever since. Being someone in favour of Jeremy Corbyn leading the Labour party, but not a Labour member, I laid out what I actually think in a Facebook comment recently, and people told me I should blog it: so I did. 1] Leaders don’t move elections, fundamentals do, and we have no idea what what those will be in five years. 2] It doesn’t matter to the health of the British state  whether Corbyn can win an election. His party just lost one and in a Parliamentary democracy Her Majesty’s Loyal Opposition (HMLO) has a job to do. Let me digress on that subject. In a Madisonian democracy (what the United States came up with) getting things done is extremely difficult by design. The purpose of the legislative party which lost an election is to work with the victors to achieve compromises, allowing stuff to get done but moderating both the speed and the ideological extremism of the policy process. In a Parliamentary system, however, the opposite is true: passing legislation is pretty easy for a victorious party with a large majority, say 60 or 80 seats. The system is designed to enable Her Majesty’s Government (HMG) to get things done. HMG must navigate trickier waters if the majority is narrow (as with the current Tories) because backbench rebellions become a major vulnerability, when the system is working properly. The purpose of HMLO in the Commons, therefore, is to vigorously oppose the policies of the majoritarian party in debate: and their purpose in the Lords is to moderate the excesses of the Commons, as it is for all Peers. opposition parties share ideological commitments and positions. What happens is that the Overton Window gets dragged far out of balance in one direction. It’s possible (though tenuous) to argue that something of the sort happened in a leftwards direction in the 1960s to the early 1970s. It is inescapable, if you read competent macroeconomists, that the reverse has happened more recently. New Labour, the Orange Book LibDems, and the Tories all share an ideological bias toward neoliberal and authoritarian policy-making, regardless of evidence of dysfunction. All three share a commitment to appeasement of the Murdoch press: and given the weight of the Murdoch empire and the Tories’ current attempts to euthanise the BBC, you can see how things got this bad. And they are bad: our public debate is so divorced from reality that a government which had presided over a vast loss of productivity and a significant fall in real wages across 60% of the working population won re-election based on perceived economic competence. The terms of debate have not moved, they have been dragged, far to the right. The Overton Window, the range of positions which will be taken seriously by the press and the political establishment, no longer includes even moderate centre-right positions since May this year : and a moderate left-winger can be decried across the front pages as a ‘radical’. Something is rotten in the State of this Union. Parliamentary systems work because of diametric tension: the left pulls left, the right pulls right, and progress is made between them depending on the reliability and persuasiveness of their advocacy. But for over a generation there has been no electable party pulling the debate, let alone policy, to the left. This problem reached its nadir with Harriet Harman as Interim Labour leader literally requiring HMLO to abstain from Opposing. It’s as if they’ve forgotten that they’re meant to be Loyal to HM, not to HMG. That’s a major problem. Thus, my position on Jeremy Corbyn is this: he will lead his party in a genuine opposition to the (again, very narrow) Tory majority in Parliament. That is the constitutional duty of the Leader of the Opposition, and our country will work better if HMLO take up the traces again. I am interested in seeing what Corbyn will do with the popular engagement he’s managed to generate, and in particular whether he can bring back the supporters who fled New Labour for the LibDems and then for the Greens, UKIP and the SNP over the last 10 years. I’m interested in seeing what it will be like to once again have someone at the dispatch box who wants to talk about policy rather than indulging in ad hominem. But I really don’t care what people think of his electability. Literally no-one can even speculate about that with any accuracy right now. His policy positions are mostly interesting because of their democratic process rather than their substance, since there is no likelihood of them getting enacted for at least five years. By that time they will have substantively changed along with the changing fundamentals, in ways we cannot predict, so prognostication is a waste of time. But all the evidence says that he will lead HMLO to effectively advocate for the left in public debate and in Parliament, and that can only be a good thing. The NHS, sensible unemployment support, North Sea oil investment over 20 years, disability assistance, human rights legislation, health and safety at work, etc. His electability might matter to Labour partisans, but it doesn’t matter to me. Cf. the electoral bloodbath suffered by the LibDems this cycle: their vote share in the last three cycles has been a lot less tribal than that of Labour or the Tories over the past 70 years, and is therefore much more vulnerable to shifts in the press. Joseph P. Overton was a political scientist, who defined the concept of the ‘shifting centre’. At any given time, there is a pair of extremes outside of which views are not taken seriously. Historically, in any given time period, people have tended to assume that these are some kind of moral absolute, but they actually move, and more importantly, can be deliberately moved. For recent examples, examine the rise of marriage equality and the collapse of cannabis prohibition in the US.